Mark introduce the new range of color sorters SMART GIANT V3 developed with our painstaking experience in color sorting field. The technological advancement also based with the ideas from the millers. Majority of the components are sourced from the world's best of its kind, ensuring that the components are built to give best performance and it is proven. SMART GIANT V3 used with high speed camera and high speed ejector valve to quality sorting performance and minimum product loss. From 480 channels to 560 channels . SMART GIANT V3 offers wide range of sorting capacity from 5 tons to 6 tons of polished rice per hour. 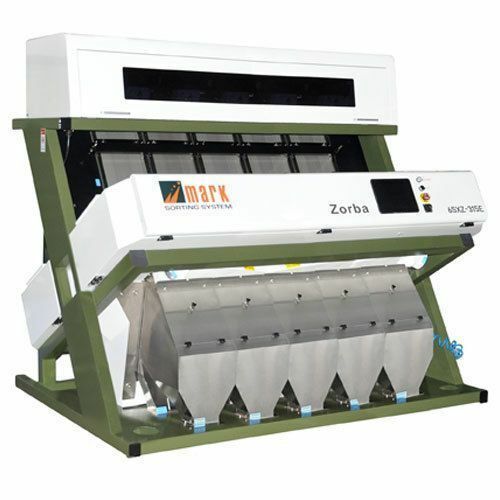 The SMART GIANT V3 series color sorter gives significant performance in all types of food grains such as rice varieties, dal varieties, pulses, wheat , beans, nuts etc. Auto turning - automatic product testing facility avoid industrial setting for each product. Automatic ejector test - individual valve testing.